This article refers to the entire Type D-class; it is not about an individual vessel. ww2dbaseIn mid-1944, with coastal defense requirements becoming urgent, the Japanese Navy developed the Koryu Tei Gata Type D midget submarines. More than just another improved version of the Type A, this was a new design. They were the largest of Japan's midgets, displacing about 60 tons, 86 feet in length, with a five-man crew, featuring a more powerful diesel engine, and had improved operating endurance. Koryu's had the same armament as the Ko-hyoteki Type A's: two muzzle-loaded 17.7-inch torpedoes. As with the earlier types, individual boats had alpha-numeric names in the "Ha" series beginning with Ha-101. Some 115 units had been completed when Japan capitulated in August 1945. Nearly 500 more were under construction. 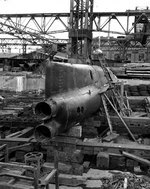 Some of these submarines intended for training pilots for Kaiten type manned torpedoes, had an enlarged conning tower and two periscopes. ww2dbaseType D boats were employed off Guadalcanal and the Solomon Islands in 1942-43, where they achieved modest success against U.S. shipping. They were deployed around Midway, the Aleutians, the Bismarck Islands, the Philippines, the Marianas, and Okinawa as shore-based defensive units, but their overall effectiveness was negligible at best. ww2dbaseSources: Wikipedia; Naval History & Heritage Command; Combined Fleet; Japan-101.